I am a saloonkeeper’s daughter. It was the saloon or the tavern. If you were ever there, you would never have called it a bar. 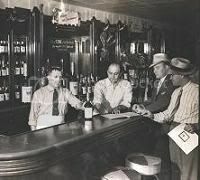 My mother and father had a deal about the saloon. She ran the family. He ran the tavern. He didn’t paint the bedroom. She didn’t tend bar. My parents were the two smartest people I’ve ever met. They taught me everything I know about love and about strength. They also taught me how people think. I’m not sure why my mom and I were at the saloon that day. I was home from college. We must have been meeting my brother. He must have been in town to visit. That seems to be the only reason we ever ended up at the tavern together once I was in college—someone was visiting and the tavern was on the itinerary. My dad made the best pizza in town and it was an easy place to meet and greet, a second-home to everybody. I was about 20. That made my mom 53. She sat to my left. Some old guy was to my right. Funny how the video replay focuses in on a detail of an important memory, and the rest of the picture fades so completely from sight. I have no idea what that guy looked like. I keep thinking of green work clothes and plaid, but I don't know why. We sat on those chrome-legged, round bar stools with the red-leather seats. The retro ones that weren’t retro back then. It was a bright afternoon, dark in the bar, and the little Christmas lights were on. The little Christmas lights were always on. That’s part of what made it a saloon. I have no idea what we were talking about-my mom and me. What do mothers and college kids talk about? I’m a mom of a college kid and I still can’t explain what that kind of talking is. We talk about meaningful nothings. It's like learning conversation all over again. It's mother-son, friend-to-friend, how'd-you-know-that, whoops-there-I-go-again talking. At some point the old guy next to me leaned in and interrupted. “Daisy,” he said. All of the men said it the same way Day-zee. She’d been called that since she was thirteen. Someone once addressed a letter to Daisy, Ottawa, Illinois, and it was delivered to her. In a town of 20,000 people that seems like something. “Introduce me to your daughter,” he slurred. My mother obliged him. It was my father’s saloon. He decided to buy us both a drink. The bartender came. I asked for a Coke. “A shot of Jack Daniels,” said my mother. I barely managed to stay on my stool. The old guy next to me . . . (I’m not kidding he had to be at least 40.) . . . went to the GENTS shortly thereafter. Which gave me a chance to talk to my mother. This shot was a curious thing. My mother looked back with a smile I now own. I could tell she was about to teach me. So whenever a jerk in a bar offers to buy me a drink, I seldom refuse him. If he asks what I do for a living, I say I'm a saloonkeeper's daughter. You know I love starting my mornings to your stories. You remind me so often of things like that in my life. Great story. And I learned something new :) Never turn down a drink. You know I'll forever think of this story when I hear those words murmured now! Ack I misread something, that's why I deleted my comment. But what would guys say if they see you dump that drink on the floor? Every now and then, my mom would really come out with a good one. I suppose I do the same for my son, but he'd never let on that I do, or which thing I do it is. But I always that this one wasa great business story. I used to tell it to new editors about the different ways to look at things. That the whole thing, if you do it right, the shot is so small the guy never notices that you drop the drink on the floor. In this case, he was still in the GENTS when she did it. Nice. Don't turn down a drink that you can turn over. But what if you LIKE Jack Daniels? But I get it. It's a nice lesson learned. Yes, it does and I see my mom smiling the rare occasions that I actually do it. I had to say something here. I almost though, oh no, here's another practicing alcoholic successful, and I have been sober and unsuccessful for 7 years basicly. I am amused, so amused by your blog, I added it to my downtownpublishingdotcom site. A couple years ago already. I NEEDED TO ANNOUNCE THE CREATION OF PreciousStuffDotBiz. PLEASE CHECK THIS OUT. OYA, we call that alcohol abuse whereI come from, but I see your point! Dumping drinks bought by jerks: that's what potted plants are for... which is the only thing that possibly explain the rise of those fern bars in the 80s. Or so I'm told. Thanks for the comment that made me go back to re-read and re-live this story. It's more fun this far away. Haven't had the opportunity to do a shot like that in a while. . . .